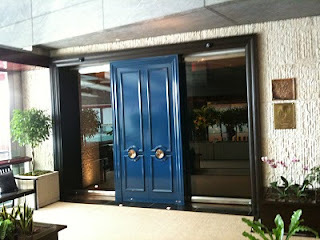 I apologise for taking so long to post this post about our meal at Per Se in New York. It's taken a while to get used to being back in the UK with it's humdrum weather and everyday problems. The only problems we had on honeymoon were what to eat and drink for breakfast, lunch and dinner! The drink part more difficult than anticipated with the size and variety of the wine lists. In my top 50 cookbooks I mentioned two books by Thomas Keller, The French Laundry Cookbook and Bouchon. The French Laundry is Thomas Keller's flagship restaurant in Yountville in the Napa Valley and has been wowing its diners with contemporary French/American food since 1994. 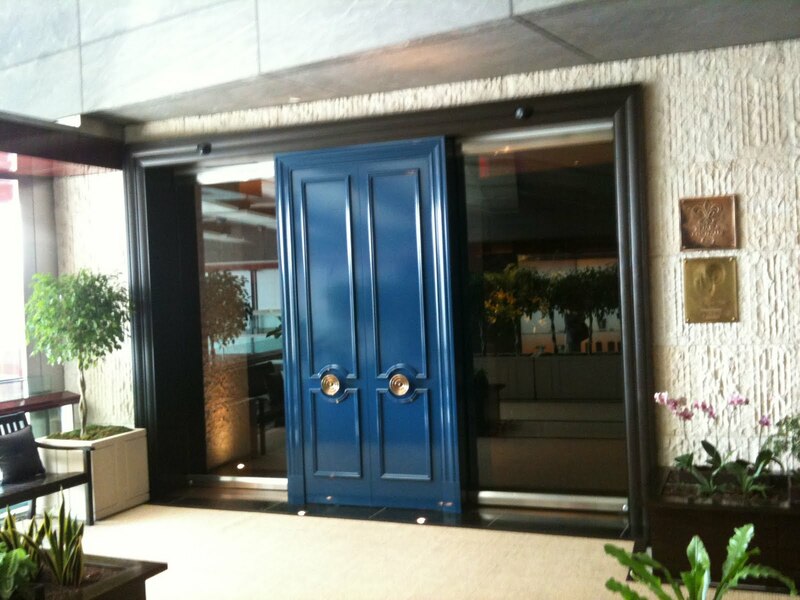 In 2004 Keller opened a sister restaurant in New York named Per Se. These restaurants are two of only six in the US with three Michelin stars such is the quality and dedication to perfection of these kitchens. The status of Per Se in the New York restaurant world means that it is quite tricky to get a reservation, certainly one at a decent time. But we persevered and maybe via a friend of a friend or maybe by spread betting on the backup list we managed to get a 9:30 table on a Saturday night. Per Se is housed on the fourth floor of the Time Warner Centre on Colombus circle. It is a bit strange to walk in through the side entrance of a shopping centre to get to any restaurant let alone one like this but this isn't a normal mall. It also boasts another top restaurant, Masa, as well as a lot of fancy shops. It was Saturday evening and I was very excited as we entered the garden and approached the front door. The glass panel to the left slid open and we were greeted by a dark, plush, deep red entrance hall and an English accent from the greeter. We were then shown to our table, drank some excellent champagne and perused the tasting menu and wine list. There were a number of choices to be made and this would take some careful consideration. 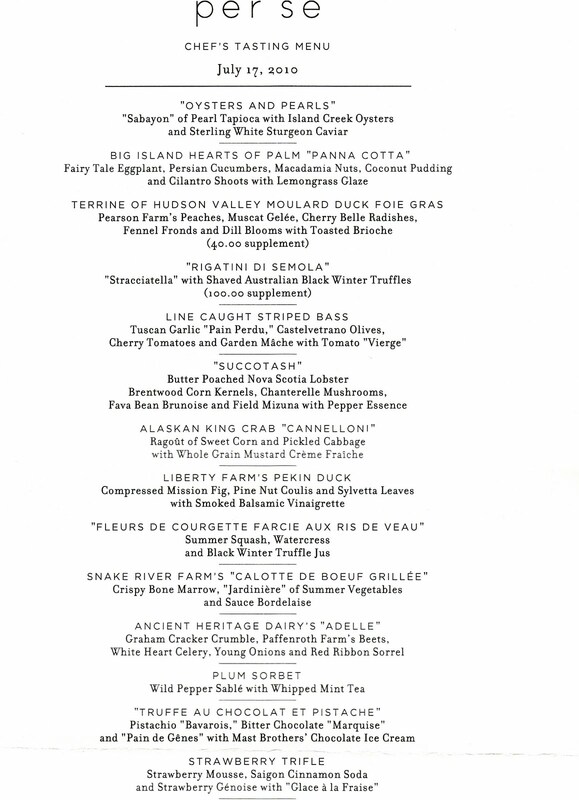 This is a scan of the menu we pilfered on our way out. It is almost identical to the one we had but the striped bass dish was replaced with Kindai tuna. This I'm afraid is one of the only pictures we have of the meal. It just felt wrong to sully our experience by wasting time, taking pictures instead of enjoying each other's company and the outstanding food which was being laid out in front of us. 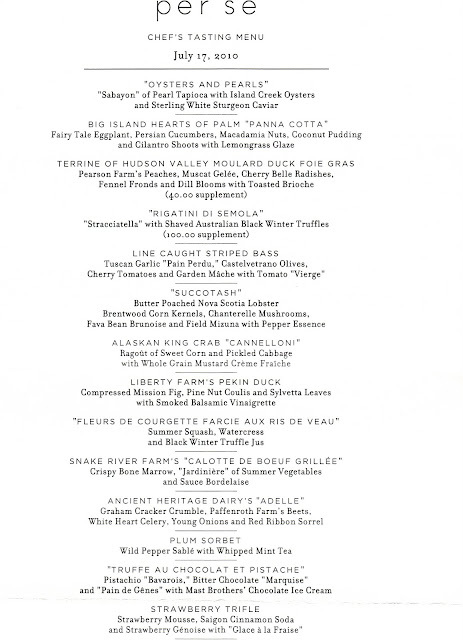 A restaurant with Per Se's reputation will always keep a number of its famous hits on a tasting menu like this one. Per Se has a few chart toppers which made an appearance during our meal. The first of these which was not on the menu was the famous salmon tartare cornets topped with red onion creme fraiche. Just like tiny ice-cream cornets but with fresh raw salmon these were a lovely start to the meal. I won't describe all of the dishes but will highlight our favourites. The tuna was fantastic, (which was a relief because Kindai tuna is a very expensive ingredient). The courgette flowers stuffed with veal balls was much tastier than its English translation may lead you to believe! The lobster succotash dish and the Calotte of beef were also stand-out dishes for me. The butter poached lobster was juicy and so sweet and with the chanterelles was a delicious pairing. The calotte, which is a part of the ribeye normally thrown out by the butcher, was really a really excellent piece of beef. I'm a sucker for bone marrow and it makes any beef dish better in my opinion. Gorgeous. It was past midnight by now and we were still being brought plate after plate of desserts, petit fours, biscuits and bon bons. It all started to become a bit of a bluras we gorged oursleves on sweet treats but one thing I remember well was the extra-menu infamous coffee and doughnuts dessert. It's a cappucino semi-fredo with brioche doughnuts and this is the dish that finished Claire off. So I had to eat both of them. Oh well probably only 1000 calories between them. Stuffed and somewhat dozy we left the restaurant clutching a couple of boxes of uneaten sweet things, ready for bed. The question we always discuss after any meal we have out is if we lived in the area would we go back. The answer for Per Se is a resounding yes. I think it's worth the trauma of booking and the seriously wallet busting price. We were treated very well and felt completely at ease. In actual fact we are sort of going back. Next year we are going back to the states for the second leg of our honeymoon and this trip will take in a visit to Yountville where we are hoping to book tables at the French Laundry and Ad Hoc. Here's hoping it's not as difficult to get a table at the French Laundry....!